Tube feeding can be used for cleft palate puppies or for feeding large litters in a effecient and timely manner. How to start tube feeding & what I have done. Always refer to your vet first! The tube needs to be marked at the end of their rib cage. I will start off by saying. DO NOT tube feed unless your vet has taught you how to do this! Also, make sure that you get the tube into the stomach and not into the lungs. 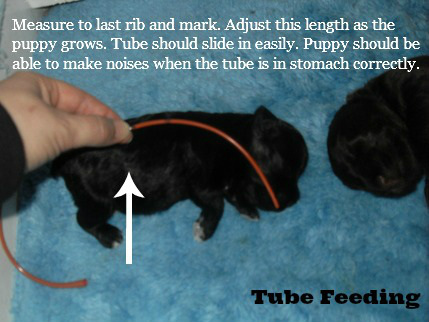 The puppy should be able to breathe with no problem and make noises if the tube is in the stomach. You measure from the mouth to the end of the rib cage and mark the tube (pictured left). As the puppy grows, you will have to adjust this measurement. Aspiration is the biggest risk and this is caused by not getting the tube in correctly or by over feeding. Lay them in your lap flat or a flat surface to feed. The neck and head should be up and bent slightly. The tube size to start is an 8FC Urethral Catheter, at one pound it will be a 10FC, and when she is bigger a 12FC. Don't forget, once the tube is inserted -- hold the head/tube steady so the tube doesn't slip! From three weeks to four weeks old -- I will feed her 8 times in 24 hours (unless she needs more feedings based on weight gain). For example, 8am, 10am, 12pm, 2:30pm, 6pm, 8pm, 10pm, and 4am. Remember to weigh them daily to know how much to increase the amount being fed. The puppy should be gaining weight daily (about 2/3 of an ounce). Make sure that if you have a large breed puppy you find out if they need more formula then a smaller breed from your vet. At 4 weeks old you will need to add meat to the diet -- HOWEVER, set this up with your vet. From week four until six weeks old -- Okay, at this point a puppy can't thrive on formula alone and the amount needed would be too much for their stomach to hold. So, for Lady BB I went to my vet and he has a high calorie canned meat (Hills Prescription Diet a/d). At first I will mix the meat with water and formula but by six weeks old it will be meat, water, and Di-calcium phosphate only (puppies need di-calcium and the canned food is for adults but it's very fine and the best kind to get through a feeding tube). For a two pound puppy it's one can a day of this meat with the Di-calcium.... The can is the size of a tuna can (meaning it's a small can). NOTE: at 5 weeks old Lady BB started eating hard puppy food on her own and drinking from a water bottle. Try this before feeding the canned meat through a tube. Six weeks old and after -- Lady BB eats hard puppy food and drinks water from a bowl or rabbit water bottle. She has only needed one clean out of her cleft by my vet. This was at 5.5 months old.